With innumerable entry points, keeping a track of a zillion keys might seem like a tough task. Furthermore, you need to make copies, hand them out to the designated employees, keep a track of them, make copies for the missing ones, rekey locks if keys go missing or are stolen and more. Such elaborate key management sounds hectic, doesn’t it? So, is there a better, more efficient alternative? There is – go keyless today! Most business establishments in Hartford, CT area are already reaping the benefits of keyless entry locks, commercial grade. Don’t fall behind; consult with Hartford Locksmith And Key today. Owing to the surge in popularity of these systems, the market is flooded with a wide array of products. Most are counterfeit or of poor-quality and will prove to be a liability than an asset, should you choose to buy them. Trust Hartford Locksmith And Key to help you procure the best quality, and high-end keyless entry locks, commercial type for your property. 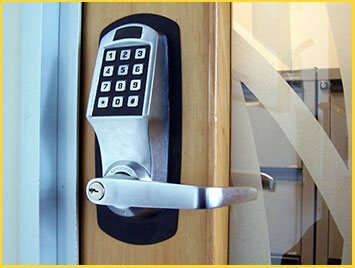 For our keyless entry locks commercial service, call 860-544-9074 now!